The Antipodes Islands lie in the South Pacific ocean 870km (540miles) to the south-east of New Zealand. 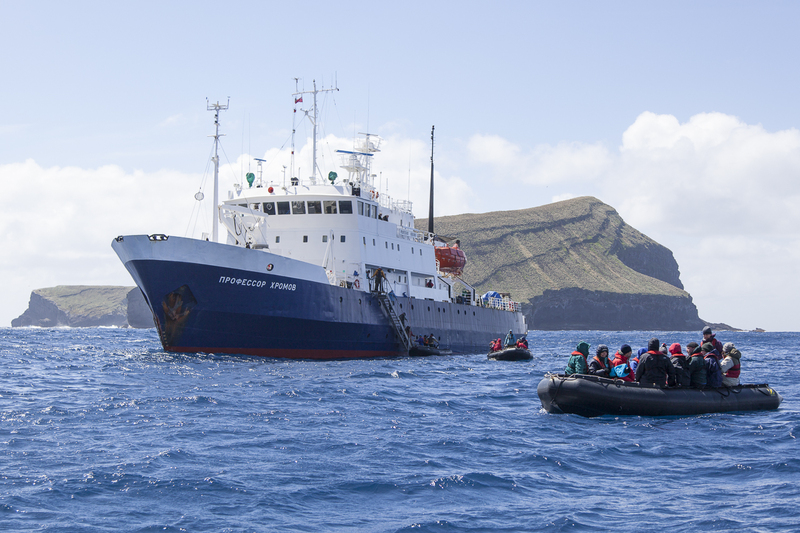 They are a unique stop along the way for those enjoying tours by ship around the Subantarctic. The group consists of one main island, Antipodes Island, of 60sq km (23sq miles), Bollons Island of two square kilometres (0.7sq miles) to the north, and numerous small islets and stacks. The highest point is Mount Galloway at 402m (1,318 feet), also the group’s most recently active volcano. Ecologically they are part of the Antipodes Subantarctic Islands tundra eco-region. The island group was originally called the ‘Penantipodes’ meaning 'next to the antipodes’, because it is almost on the opposite side of the world from London. The name has been shortened to ‘Antipodes’. Mice. the only pests on the islands, eat the eggs and chicks of seabirds. They also eat huge numbers of insects and the seeds of plants that are critical to the health of the islands and a food source for the native species. The Million Dollar Mouse campaign is working to raise funds to eradicate these pests so the islands can rejuvenate. 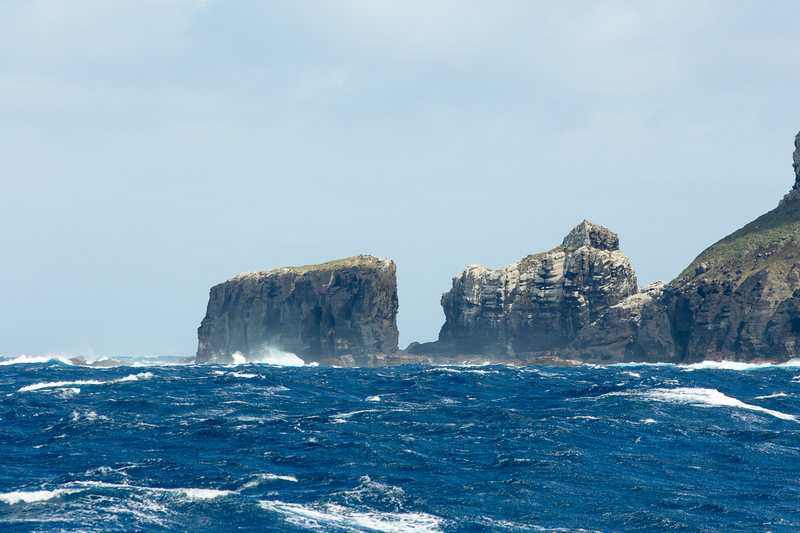 The group consists of the main Antipodes Island with off lying islets such as Bollons Island, Archway Island, Windward Island and Leeward Island and several rocky stacks. Antipodes Island itself is roughly triangular in shape 7km by 5 km with an area of 2025ha. Its central undulating plateau has several volcanic cones, dissected by steep gullies. Entirely volcanic in origin, only a few fragments of underlying basement granite have been found in the Antipodes. The main island was formed during two volcanic periods and is overlain by ash and basaltic lava flows, which slope to its centre, forming spectacular and inaccessible cliffs peaking at 366m (1,200feet) and encircling the island. These are especially dramatic on the east and west coasts. The central volcanic cone is Quaternary and there are similar volcanic vents at Crater Bay, Leeward Islets, the Windward Islets and Bollons. There is a prominent raised beach around most of the coastline. Originally named the Penantipodes because of its situation near the antipodes of London, the Antipodes were discovered in 1800 by Captain Waterhouse of HMS Reliance. An American sealer under the command of Captain Pendleton was the first to station a sealing gang on the Antipodes, when the brig the Union of New York left an officer and 11 men there in 1804. On returning to Sydney the Union of New York sailed for Fiji and disaster, for the ship was lost and the entire crew massacred. The sealing gang was eventually rescued in 1805 after more than a year on the Antipodes. The gang had collected almost 60,000 skins. Other sealing gangs visited these Islands, but by the 1830's the seals were all but extinct and there was no further sealing. In the early 1880's there was renewed interest in these Islands for the penguin skin trade. A large number of these skins were collected to meet a demand for fashionable ladies' muffs. On 4 September 1893 (while on a passage from Rangoon to Talcaguano with a cargo of rice) the Spirit of Dawn was totally wrecked on a reef off Antipodes Island. Five members of the crew, including the Captain, were drowned. The remaining eleven members of the crew made it into a life boat and were able to land on the island. During their stay their only food consisted of mutton birds, mussels and roots. They had to eat these raw as they had no means of lighting a fire. They remained on the island for 87 days without a fire, during which time they lived in a cave beneath an overhanging bluff. They hoisted a flag above the cove on the highest point of the island, which was eventually seen by the crew of the New Zealand Government Steamer Hinemoa. The survivors had never found the government depot which was four to five hours walk from their camp. This contained clothing and provisions which would have made their enforced stay a little more pleasant. On 13 March 1908 the President Felix Faure was completely wrecked on Antipodes Island. Her entire crew of 22 managed to reach the shore and were rescued by HMS Pegasus in early May of the same year. The survivors found the Provisions Depot which had been established by the New Zealand Government and lived on albatrosses, penguins and shellfish. At one stage they caught a calf, but the bull, cow and sheep which had been left for food by the Government had all perished before their arrival. It was a particularly cold sixty days (with rain, hail and snow on all but four of them) that they had to endure before they were rescued. The Antipodes group has significantly less rainfall than for instance the Auckland Islands, no doubt a factor in the particularly sparse flora. 166 species have been identified, of which four are endemic and 68 are indigenous vascular plants. Three introduced higher plant species are all very localised, being restricted to the areas of greatest human disturbance. Vegetation is almost entirely tussock grassland dominated by Poa Litorosa, but is often lush and, due to lack of frequent grazing, in good condition. Littoral tussocks are particularly large and dense, reaching two metres, but on exposed sectors of the coast or in areas that have been heavily burrowed by seabirds, are interspersed with ferns and several megaherb species. Localised bogs are largely free of tussock grass but have much Anisotome antipoda, Stilbocarpa polaris and patches of Coprosma purpusilla and Hymenophyllum multifidum. At higher elevations, the fern Polystichum vestitum, in its semi tree form, is an important constituent of grasslands. Sheltered areas may have dense stands of Stilbocarpa polaris and patches of Coprosma antipoda; the latter as well as three congeners are the only species of woody plants to occur in the group and in places they form near-impenetrable clumps. Where giant petrels have manured the ground and areas of seepage occur, the endemic herb Senecio antipoda is abundant. The Antipodes Islands are home to numerous bird species including the endemic Antipodes Snipe, Antipodes Island Parakeet and the Antipodean Albatross. The island group is also home to two thirds of the world population of Erect-crested Penguins. The Antipodes are the world’s principal breeding area for the sexually dimorphic Antipodean Albatross. There is a small colony of Black-browed Albatross, with Light-mantled Sooty Albatross breeding largely on the main island’s coastal cliffs. Other breeding seabirds include the Northern Giant Petrel, which often attacks the penguins and scavenges the eggs and chicks of other seabirds. Grey, White-chinned, Soft-plumaged and White-headed Petrels are widespread. Among land birds, the island is the breeding ground for one of the world’s rarest - the Antipodes Island Parakeet. The islands also support endemic populations of Red-crowned Parakeet and New Zealand Snipe. Scattered breeders include Subantarctic Skuas, Kelp and Red-billed Gulls and Antarctic Tern, while the New Zealand Pipit is abundant. The Erect-crested Penguin, Eudyptes sclateri, is endemic to New Zealand, and breeds on the Bounty and Antipodes Islands. It is a medium to small, yellow-crested black-and-white penguin, standing 50 to 70cm (20 to 28inches) and weighing 2.7 to 5.2kg (6 to 11½lb.). It has bluish black to jet black upper parts and white under parts, and a broad, bright yellow eyebrow-stripe which extends over the eye to form a short, erect crest. The Erect-crested Penguin has been poorly studied and little information about the species has emerged in past decades. They nest in large colonies on rocky terrain. A study of diet has never been completed but judging from its long foraging trips, like other crested penguins it probably lives mainly on pelagic crustaceans and fish. Numbering approximately 154,000 birds, this penguin is currently endangered due to population decline and a small breeding range restricted to two locations. 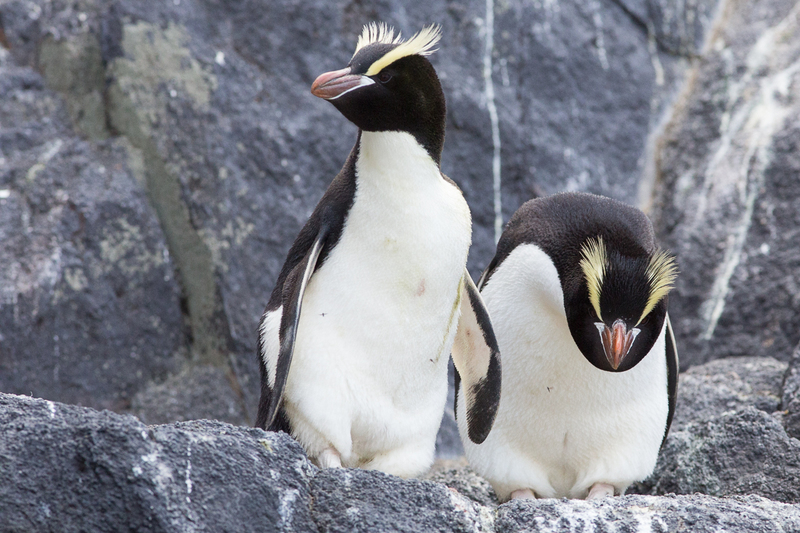 When dry, the Erect-crested Penguin is identifiable by the upright yellow feather plumes of its crest. Erect-crested Penguins have a distinct gular pouch, a more parallel bill, and the yellow supercilium attaches higher on the bill than in Snares and Fiordland Penguins. It is extremely difficult to identify at sea because the feather plumes droop down when sodden. Immature penguins have a pale yellow supercilium without the long plumes, and a mottled grey throat. They can be distinguished from other crested penguins by the lower supercilium, their size and the gular pouch. Erect-crested Penguins breed on rocky slopes bordering the shore. Some build nests, but most lay their eggs on the bare rock. After a long courtship period, two eggs are laid but the first, much smaller, A-egg is invariably lost, in most cases on the same day or before the B-egg has been laid. The largest of the genus, the Antipodes Island Parakeet, Cyanoramphus unicolour, was recognised as far back as 1831 when a specimen was captured and brought to England, to live out its days in the Zoological Society’s gardens. After it died, its skin was preserved in the British Museum. According to Oliver, it was this bird which Edward Lear portrayed in his famous folio monograph published in 1832, ‘Illustrations of the Family of Psittacidae, or Parrots’. In March, 1886, the species was rediscovered by Captain Fairchild of the government steamer Stella, at Antipodes Island. On a later visit, the crew obtained a number of them and brought them to the mainland alive. They were apparently easily run down and caught by hand. Buller related how readily they took to confinement even though captured as adults. This parakeet is common on the main island and Bollons Island, and occurs in small numbers on Leeward, Inner Windward and Archway Islets. In 1978, the population was estimated at 2,000 to 3,000 birds. Population trends are unknown, but numbers are likely stable. It is found throughout the island habitats, but is most common in tall, tussock grassland and sedges. These plants form the bulk of its diet, which is supplemented with seeds, berries and flowers. The parakeets are also known to fossick around colonies of Rockhopper and Erect-crested Penguins for scraps of fat left on skua-killed penguin and petrel carcasses. The parakeet nests in underground burrows, often more than one metre long, in tussock or sedge. In captivity, clutches number five or six birds, but only one to three fledged young are generally ever seen with adults in the wild. The young start breeding at one year and the birds may be quite long-lived – two recaptures from Antipodes Island were each at least 10-years-old. Accidental introduction of predators such as rats, cats and mustelids is a clear potential threat to the Antipodes Island Parakeet. The islands are nature reserves, and landing is strictly by permit only. In 1907, 12 birds were released on Kapiti Island, they survived for approximately 20 years. The species is widely held in private aviaries and adapts readily to captivity. A captive management plan has been put in place to safeguard the species. Reischek’s Parakeet, Cyanoramphus hochstetteri, is a small green parrot confined to Antipodes Island. The common name commemorates pioneering naturalist and collector Andreas Reischek, who collected specimens in 1888. Reischek named it Platycercus hochstetteri for the son of his friend, Austrian geologist Ferdinand von Hochstetter, who created a geological survey of New Zealand. Reischek’s Parakeet was previously considered to be a subspecies of the Red-crowned Parakeet C. novaezelandiae, which it resembles in appearance, but it was later lumped with the Macquarie Island Parakeet in a 2001 paper by Wee Ming Boon and others, following an examination of the molecular systematics of the genus which found that many of the Red-crowned Parakeet subspecies should be elevated to full species. Reischek’s Parakeet feeds on tussock flowers, leaves, seeds, berries and invertebrates such as fly larvae in penguin guano. It also scavenges the carcasses of petrels and albatross. Though the population of Reischek’s Parakeet is healthy, its limited distribution makes it potentially vulnerable to events such as the accidental introduction of rodents to its island home. It is listed as ‘range restricted’ in the New Zealand Threatened Species classification. Chilton, C (Ed) The Sub Antarctic Islands of New Zealand Vol 1& 2 Philisophical Insitute of Canterbury, Wellington, 1909. Fraser, C Beyond the Roaring Forties, Woolmore Printing Ltd, Auckland 1986. Higham, T (Ed) Sub Antarctic Islands - A Guide Book, Craig Printing Co Ltd, Invercargill 1991. Thomas, M C Forgotten Islands of the South Pacific - the Story of New Zealand's Sub Antarctic Islands by Rosaline Redwood. A H and A W Reed, Wellington. Taylor R Straight Through from London. Heritage Expeditions, Christchurch. 2006. Shirihai Hadoram A Complete Guide to Antarctic Wildlife. Alula Press Oy, Finland 2002.